I resolved use that butter the next day, when we were attending a New Year potluck. The dessert course, a couple of salads and a vegetarian centrepiece were already planned by others. I remembered some fantastic home-baked shortbreads that I recently ate at a birthday party, and figured I'd give them a go. The one extra challenge to this plan was that one of our hosts eats gluten-free! I'm delighted to report that the recipe I'm posting here works just as easily with Orgran gluten free flour as it does with plain flour. I made one batch with each flour type as a risk-spreading measure, since there was plenty of butter to go around. 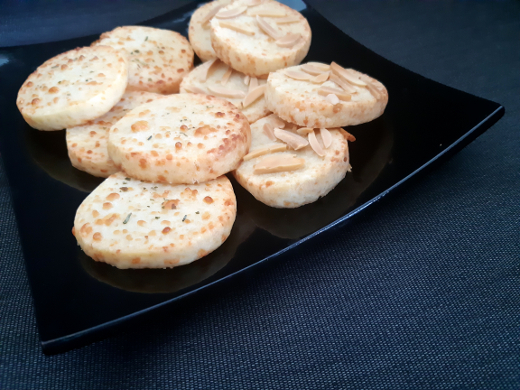 I seasoned both batches with some fancy smoked garlic and rosemary salt; the gluten-free ones had the salt worked into the dough and some leftover slivered almonds pressed into their tops, while the glutenful biscuits were sprinkled with the salt. The shortbreads were just the thing for nibbling on with cocktails before our meal. The textural difference between the two batches was very subtle. I'd baked all of them to a soft texture, and I'd be interested in gently pushing them to a deeper, crumblier brown in future. I noticed that they rapidly went stale following exposure to air, but somehow the biscuits were still all gone by January 2. Place the flour, parmesan, cayenne and salt in a large food processor bowl; pulse them together to mix. Cut the butter into rough cubes, drop them into the food processor, and blend everything together until well combined. If the mixture isn't yet clumping into a dough, add a little iced water while the blades are still running. Turn the clumped mixture onto a large sheet of plastic wrap. Bring it together into a single mass and work it into a thick sausage shape: I went for a cylinder about 4cm in diameter and 25-30cm long. Wrap the dough up in the plastic wrap and refrigerate until firm, at least an hour. Preheat an oven to 180°C. Line one or two trays with baking paper. Retrieve the dough log from the fridge. Slice it into rounds (mine were about 5-7mm thick) and place them on the baking trays. Sprinkle them with any garnishes you've chosen, gently pressing them into the top. Bake the biscuits for about 20 minutes, until they're golden brown around the edges. Let them cool for at least 5 minutes before moving them. Store them in an airtight container - they go stale quickly in the open air! where's the best in 2018?